French fries with gravy, baked potato with the works, steamed potatoes topped with crème fraîche, creamy garlic mashed potatoes, chicken fat roasted crispy potatoes… With a list like that, how can potatoes not be one of my favorite foods? It can be dressed up in so many ways and its the preparation that makes the potato so delicious but so bad for you at the same time. It’s the bad for you thing that makes me stay away from the potato as much as I can. But every so often I like to indulge. 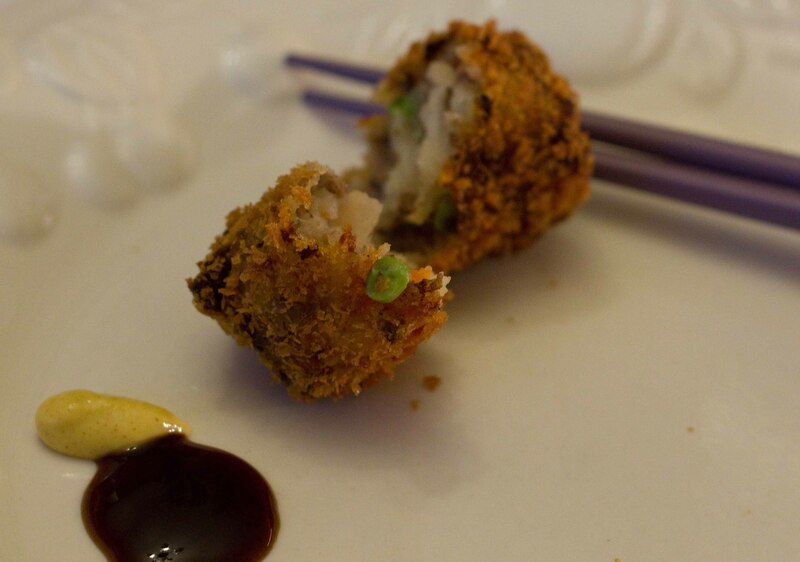 One of my favorite potato foods is the Japanese korokke, (a version of French croquettes). I love grabbing them on the go as a snack when I’m in Japan. I’ve had them at a couple of places here in Vancouver and they’re usually heavy on the grease and low on great potato flavour. My mom’s korokke are fantastic and because I know they’re a lot of work, I only request them a few times a year. Funny enough though, when I was in my mom’s kitchen learning how to make these, she divulged that she makes them at least once a week for my nieces! 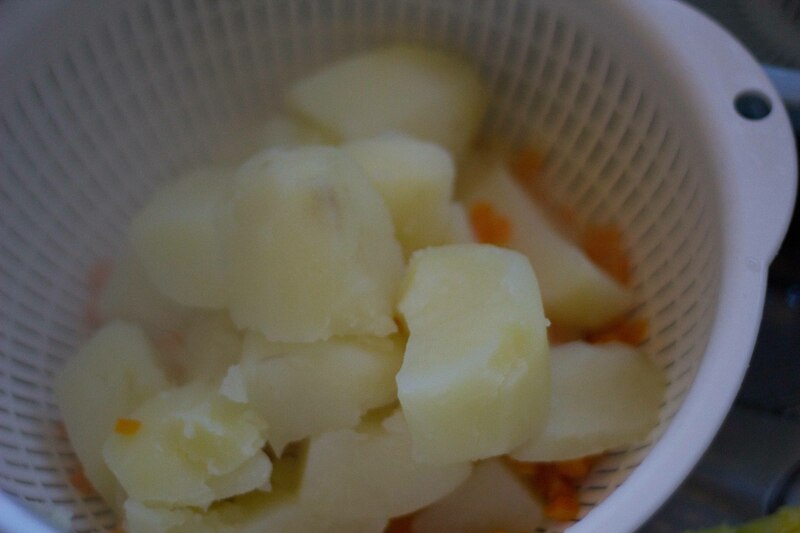 Cut peeled potatoes into quarters and put into cold water w/ 1 tsp salt in a pot to boil. Once it’s come to a boil, keep on high for 10 minutes. Add 2 small diced carrots, (cut into 1/4” dice) and reduce heat to medium, (to simmer) for another 20 minutes. Piping hot, but I still had to have a taste. When the potatoes are done, separate them into 2 bowls, setting aside the carrots. 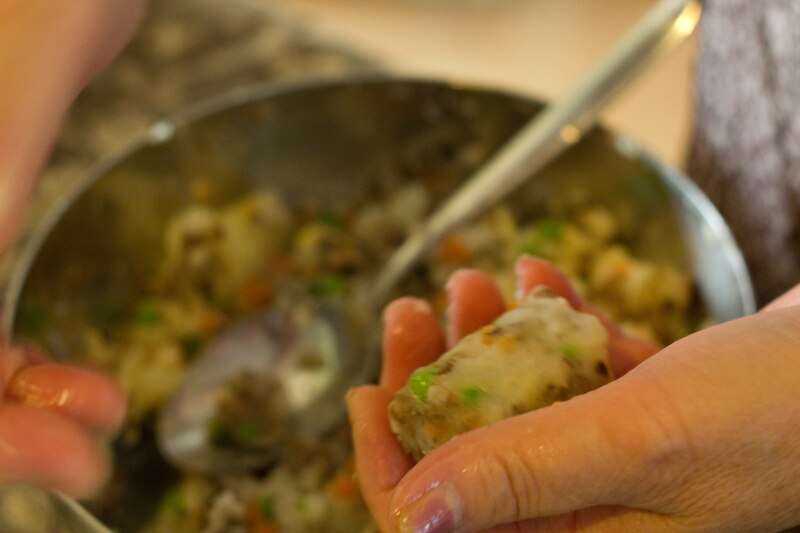 For the Beef korokke: Mash the potatoes so they are somewhat chunky, add the carrots and set aside. 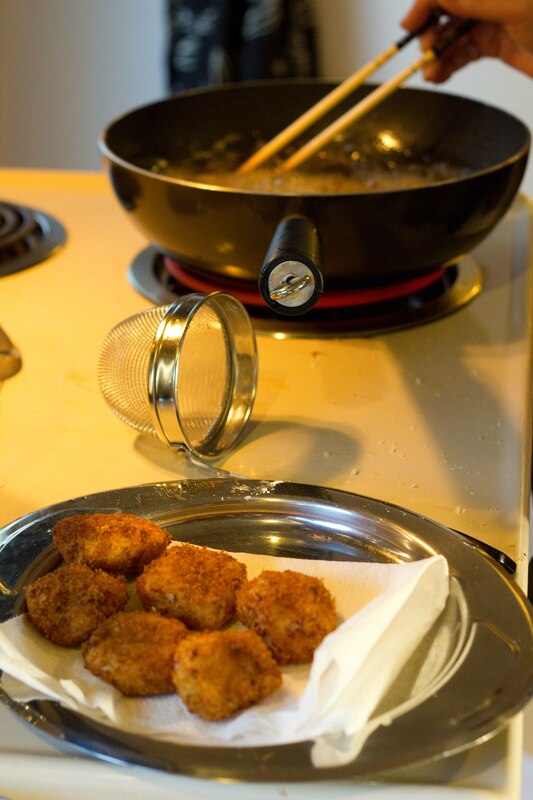 .Cut a ¼ of a large onion into 1/8″ dice and add to an oiled fry pan over high heat. 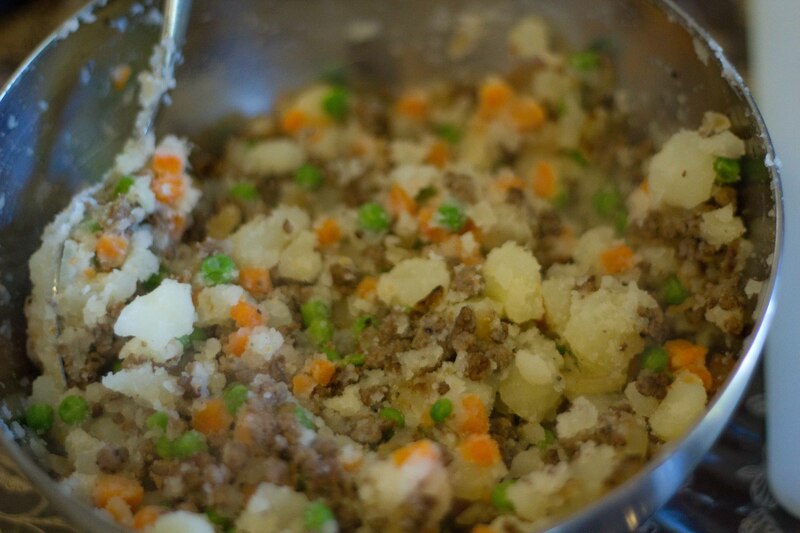 Add ½ pound of lean ground beef. Cook well and season with a pinch or 2 of salt, ¼ tsp of pepper and garlic powder. Break down the ground beef into very small chunks. Boil a ½cup peas in water for 2 minutes, drain and add to the beef mixture and give it a quick saute. Add the beef mixture into the potatoes. 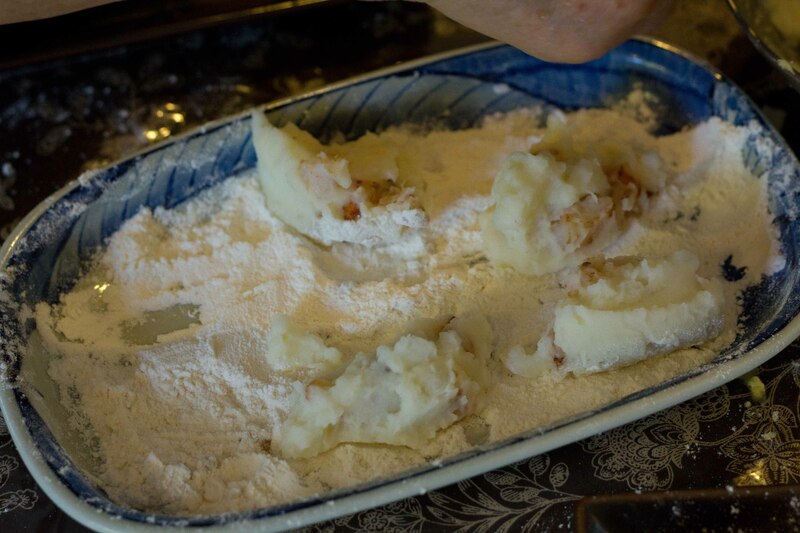 Mash the potatoes smooth or leave them chunky for texture. Taste to adjust seasoning. Form mixture into golf ball sized rounds. My mom likes to shape hers into logs. More traditionally, I’ve seen them pressed into patties. I like the logs though. Less fried outside:potato ratio. Press each piece together firmly so they don't fall apart when frying. Next comes the flour, egg bath, panko prep. I’ve seen enough Food Network to understand wet-hand, dry-hand methods, but let me tell you, it’s not as easy as it looks. 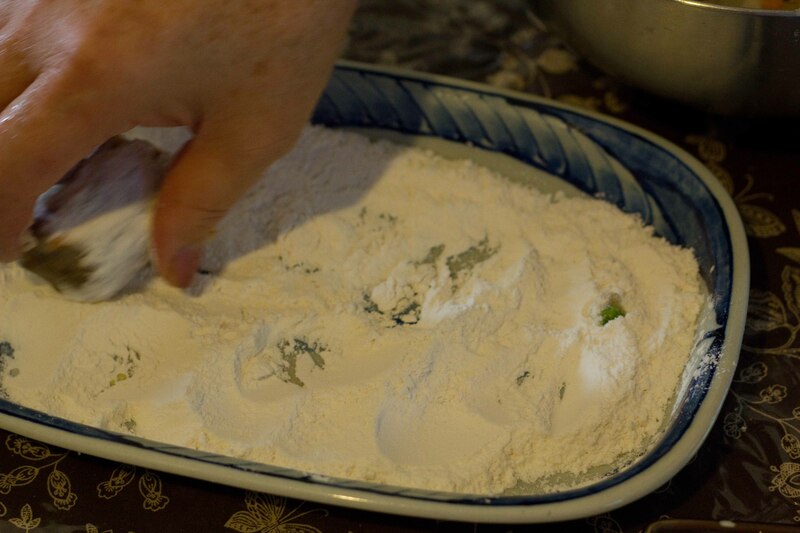 Roll each piece in the flour. 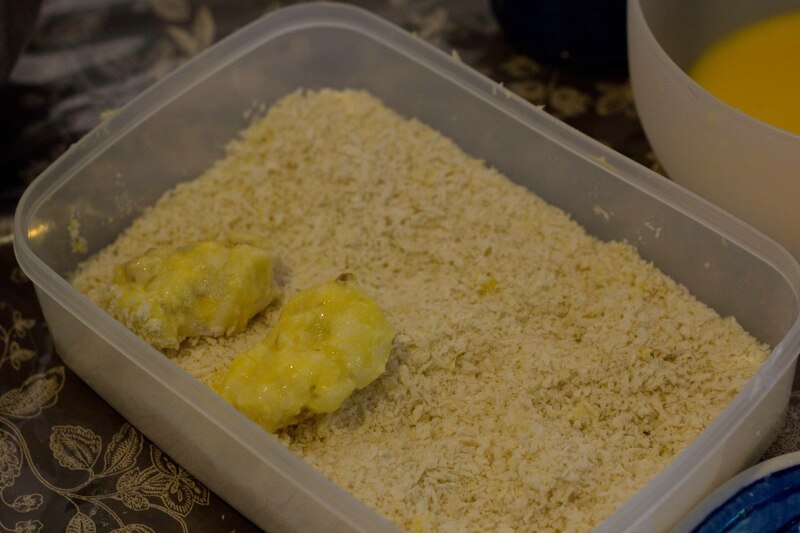 Dredge in egg and coat each with panko. They're now ready for the fryer! Cream korokke with shrimp: Mash the other bowl of potatoes until they are smooth. Add 1/3 cup milk and 2 tbsp cream and mix well. Cut 10 medium-sized prawns into 8 pieces each, (taking the tails off as well). Sauté prawns in a hot pan with a bit of oil a few minutes until cooked. Season with salt. Cool prawns and mix into the creamy potatoes. 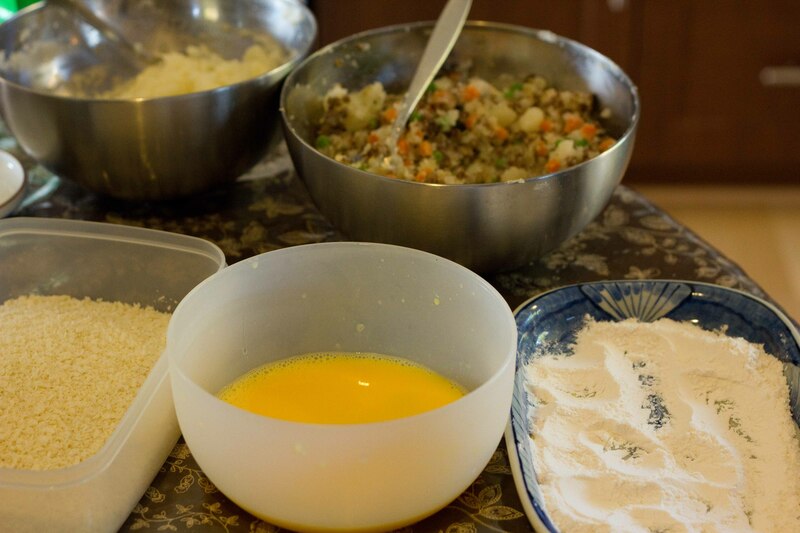 Drop spoonfuls of the potato mixture into the flour. 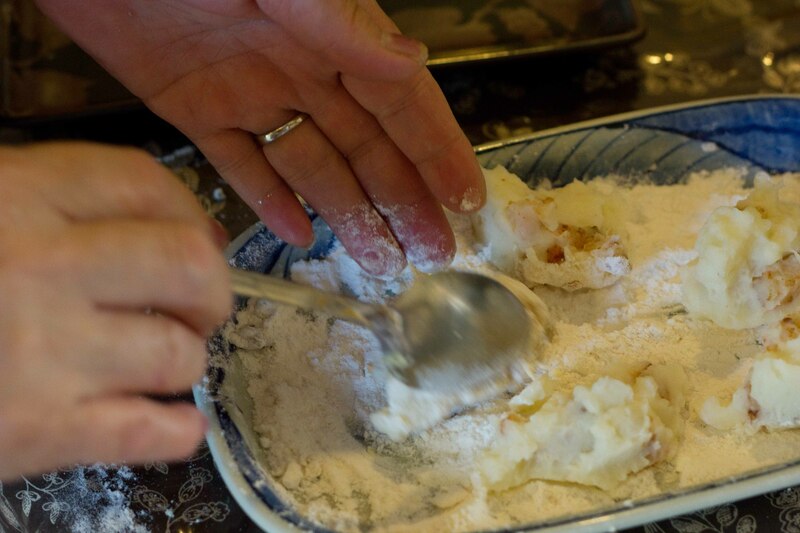 Carefully roll and cover each piece with flour. 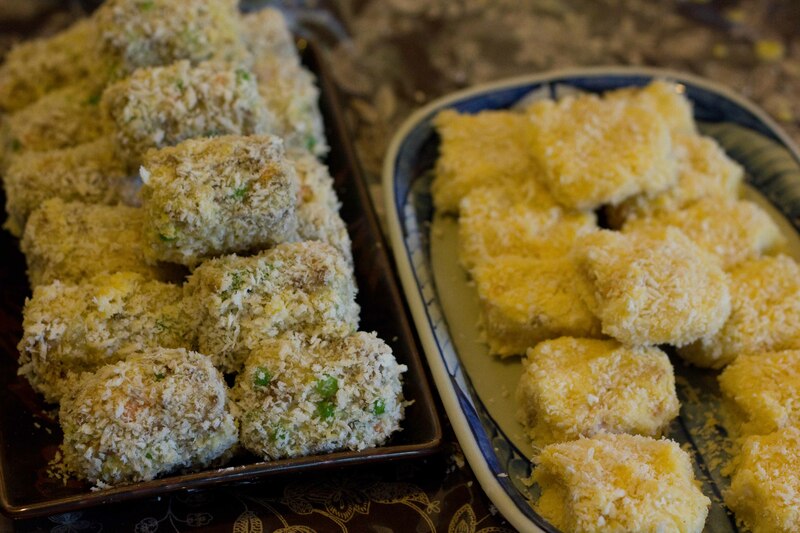 Dip the flour pieces into the egg batter and then cover with panko. Korokke 2 ways waiting to be deep-fried! Heat 2 cups of canola oil + 1 cup olive oil in a pot, (or enough to completely submerge the korokke but not fill the pot more than half way). Heat the oil until it’s very hot. Drop pieces in a few at a time and fry until they are golden brown. Eating them straight out of the fryer is the BEST! 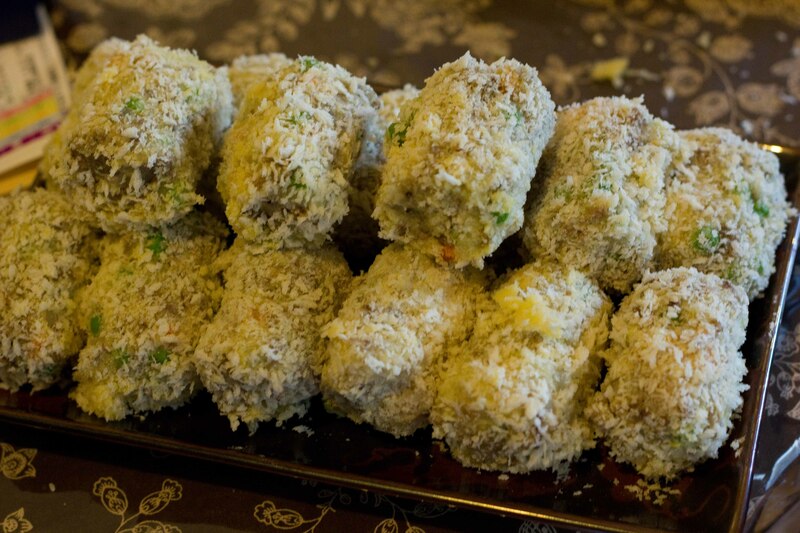 Korokke are traditionally served on top of shredded cabbage. At my house we use Bulldog sauce for dipping, (which is a Japanese version of HP sauce). We also mix in some Dijon mustard for a bit of spice.